I love baking. Much more now than ever before. Baking using none of the ‘proper’ ingredients feels like alchemy. And I’m saving a fortune on eggs! This recipe is adapted from this one on the BBC Food website. The original recipe actually works very well when you do a straight swap with free from alternatives. However, I have tweaked it to suit my personal tastes and because I felt the original recipe was a bit oily. This cake is so soft and bouncy and moist. You would never guess that it’s a great big fake cake. 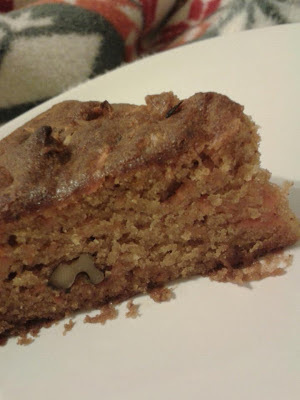 Gluten, dairy and egg free carrot cake, also suitable for vegans! Melt marge in the microwave for 1 minute. Add to a bowl with sugar and mix together. In a separate bowl weigh out the flour and add the bicarb and spices. Sift this mixture into the wet mixture, stirring gently as you go along. Add the carrots and chopped walnuts and stir in. Pour into a greased cake tin and bake at 180c (160c for fan ovens) for 50 minutes to an hour or until a toothpick/chopstick comes out clean and the cake feels springy and sounds hollow. Leave to cool completely before adding a topping. Decorate with whole walnuts and orange zest.